I’m looking forward to our reading with Laura Oliver and Jason Schossler, authors with great Web sites who both celebrate the power of storytelling. They’ll share the program this Sunday, March 11 at 2 p.m., here at The Writer's Center. 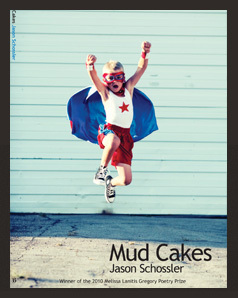 Check out the video for Mud Cakes, Jason’s first book of poems, which was selected as winner of the inaugural Melissa Lanitis Gregory Poetry Prize from Bona Fide Books. Jason, a Pushcart Prize nominee, is also the recipient of the 2010 Emerging Writer award from Grist: A Journal for Writers, and Reed’s 2009 Edwin Markham Poetry Prize. His poetry and fiction have appeared, among other places, in The Sun, North American Review, Poet Lore, Green Mountains Review, Rattle, and The Antioch Review, where his poem, “Between Jobs,” was nominated by the editors for the Best New Poets 2010 anthology. Jason is joined by Writer’s Center workshop leader Laura Oliver, who will read her fiction and discuss The Story Within: New Insights and Inspiration for Writers, recently published by Penguin. Laura’s essays and short stories appear in numerous regional and national periodicals such as The Washington Post, Country Living, Glimmer Train, The Baltimore Review, and Portland Magazine. She has taught Creative Writing at the University of Maryland and currently teaches writing at St. John’s College. Nominated for a Pushcart Prize, her work has won numerous distinctions, including a Maryland State Arts Council Individual Artist Award in Fiction. Follow her Finding Your Story Within Contest, with writing prompts, winning entries, and videos, on her blog.